Christopher Aubrey painted this scene as a way of thanking the Smith family for their hospitality to him. 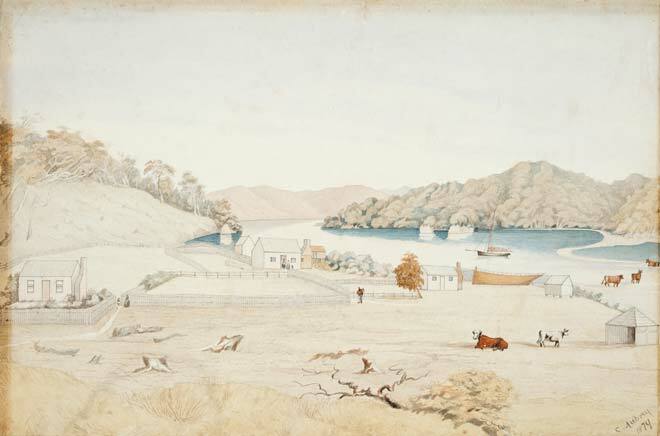 The shores and islands of Paterson Inlet/Whaka ā Te Wera were one of the settled parts of Stewart Island in the 19th century. The painting shows the farm of ‘Yankee’ Smith at the far left and the house of whaler Manuel Gomez in the middle.